I woke up at four that July morning. Maybe it was the gnawing of the ubiquitous wood rats inside the bedroom walls or the staccato song of nearby coyotes. Or perhaps my internal alarm was still set to East Coast time, as I’d just returned from my Manhattan apartment to our family’s ranch near Refugio Beach. “Do we need to do that just this minute? It’s only four o’clock.” I was groggy. It was completely dark outside my cabin’s window, as the moon had already dissolved west into Refugio Canyon. Everyone living along the Gaviota Coast has been on high alert for some time now. 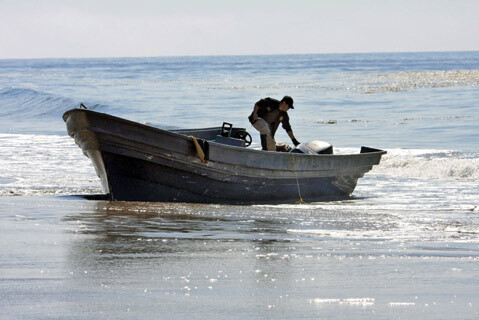 Over 30 pangas — the low, open Baja fishing boats used to smuggle drugs and people into California — have been found in Santa Barbara County during the last two years. Our section of the Gaviota Coast has a long history of crime. Our grandmother who lived on the Refugio Beach bluff told us how, during Prohibition in the 1920s, that same beach between Refugio and El Capitan from which the marijuana smugglers had just fled was used by rumrunners, who also found the deserted beaches so close to the highway convenient. “We could see their little lights in the waves at night,” she recalled. Helicopters hovered over the same beach in 1989 when a Caltrans engineer was murdered there. In 2006, I was stuck for several hours at a police roadblock when a carjacker was shot and killed at the El Capitan exit 100 yards in front of me. Arson on our coastal terrace dates back even earlier. Journals from the 1770s tell of feuding Chumash people from Dos Pueblos burning a Chumash village near Tajiguas. That canyon is called “La Quemada” (the “burned place”) to this day. In 1818, Argentine corsair Hippolyte de Bouchard burned the sprawling Ortega ranch complex at Refugio, stealing food and killing the cattle and horses just before Christmas. The Ortegas were legendary smugglers themselves, known widely for trading goods into Spanish California at Refugio Beach in violation of Spanish law. We had a similar experience 150 years later, about a mile downstream from the Ortegas’, when Caltrans burned down our grandparents’ home so the state could build a larger toll entrance to Refugio State Beach. As we watched the flames, it looked to us a lot like arson, even if sanctioned by the state. Our neighbor Vicente Ortega lived his life between Refugio and Gaviota. He told me that Guillermo Canyon, next to his adobe in the Arroyo Hondo, was named after a man who was hanged there in the 19th century. Guillermo’s name is memorialized, but not his crime. In the 1860s my great-grandmother Josefa Orella was kidnapped as a child from her parents’ adobe in Cañada del Corral, just yards from last July’s panga-boat beach. The bandits exchanged her for fresh horses when her father and the other vaqueros returned home in the evening. But the criminal history of our coastal terrace wasn’t first in our minds that July morning. By 4:30 a.m., our ranch manager Johnny arrived to check on us, our dogs, and our state of arms. He explained that his wife was “sitting in the kitchen with her loaded .45 pistol on the table” at their home down the canyon, closer to the beach. We all sensed danger and felt adrenaline’s effect on our pulses as we wondered where the runaway panga-boat fugitives were hiding in the predawn dark. We only began to relax when the first morning light illuminated the chaparral blanket on the Santa Ynez foothills north of our house. We learned later that the fugitives had fled west and were apprehended near Refugio Beach — confirming its notoriety in the history of California smuggling. I’d only been home from New York for one day, and I knew my friend was right — living on a Gaviota ranch is just like living in lower Manhattan. Both are dramatic and there are any number of things right outside your door that can kill you. Before heading to breakfast right after dawn, Johnny asked a question reflecting his uneasiness in observing the early morning shotgun lesson.